On June 8, 1967, the USS Liberty, was attacked by Israeli Air Force jet fighter aircraft and Israeli Navy motor torpedo boats. At the time of the attack, the ship was in international waters north of the Sinai Peninsula, about 29 miles northwest from the Egyptian city of Arish. On the USS Liberty, 34 American servicemen were killed and 174 wounded. Yet many Americans have no idea this attack ever happened. If they do, they have heard the prevailing myth that the attack was accidental. Very few have heard the overwhelming evidence indicating that the attack was intentional, and that Israel intended to sink the ship altogether, along with everyone on board. After getting away with this "act of war against the United States" (according to Admiral Thomas Moorer, former Chairman of the Joint Chiefs of Staff), many believe the Israeli government concluded that it could get away with anything. For 40 years, survivors of the USS Liberty have been forbidden "to tell their story under oath to the American public." 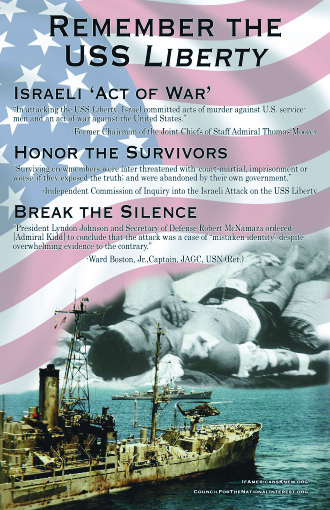 The cover-up of Israel's attack on the USS Liberty, begun under the Johnson administration, continues to this day. What have successive U.S. administrations been covering up? On the morning of June 8, the USS Liberty was secretly listening in on the Israelis who were then attacking Arab air bases from Damascus in Syria to Luxor in Egypt. The Israelis had occupied the Jordanian section of Jerusalem, and captured Sharm al-Sheikh. And while the USS Liberty eavesdropped (Bamford, Body of Secrets): a scant dozen or so miles away, Israeli soldiers were butchering civilians and bound prisoners by the hundreds, a fact that the entire Israeli army leadership knew about and condoned, according to the army's own historian. . . . At the time, Israel was loudly proclaiming -- to the United States, to the United Nations, and to the world -- that it was the victim of Egyptian aggression . . . Israel's commanders would not have wanted tape recordings of evidence of the slaughters to wind up on desks at the White House, the UN, or the Washington Post. The pattern set in 1967 -- covering up for Israeli aggression, remains a major contributor to U.S. problems in the Middle East.